Violinist, Nicholette (Nickie) Fetsch hails from the mid-West where she attended Indiana University’s School of Music, graduating with a Bachelors of Music in viola performance, and later at UOP with a Masters in Music in violin performance. 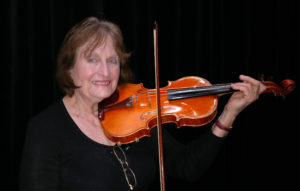 Her professional life in music includes playing with the Corpus Christi Symphony, over 40 years with the Stockton Symphony, and many solo and chamber music performances. She taught part-time at East Carolina U. and S.J. Delta College. Most of all, Nickie has devoted her musical life to private teaching, and had the pleasure of working many talented and dedicated students. In addition to music, Nickie has a love for the visual arts. Through the years, she has studied drawing and painting and her artwork has been shown and sold in many venues. Nickie has two wonderful children, the Folsom Lake Symphony’s concertmaster, Anita Felix, and a son with a career in engineering. They are her pride and joy, and she has blessed her with their wonderful families.